In a large bowl or the bowl of a stand mixer fitted with the paddle attachment, whisk together yeast, water, 1 tablespoon sugar and mashed potatoes. Let sit for 5 minutes. Add remaining sugar, lemon juice, milk, salt, eggs and 1 cup flour and stir thoroughly to combine. Replace paddle attachment with dough hook and add 1/2 cup more flour and butter, mixing on low speed until smooth. Add more flour a few tablespoons at a time, mixing on low speed, until the dough starts to come away from the sides of the bowl. Increase speed to medium and knead about 5-6 minutes, adding more flour as necessary until the dough is slightly sticky but no longer tacky. Alternatively, remove the dough from the bowl and knead for 10 minutes on a lightly floured surface until slightly sticky. You might not use all the flour, and that’s OK. Shape dough into a ball and place in a lightly greased bowl covered with plastic wrap until doubled, about 2 to 3 hours. Turn risen dough out onto a lightly floured surface and punch down. Shape into a large free-form round, into rolls or into a sandwich loaf. Place free-form loaf or rolls onto a lightly floured baking stone or parchment paper-lined baking sheet; place rectangle into a lightly greased 8-by-4-inch loaf pan. Cover with a towel and let rise 45 minutes to 1 hour. Preheat oven to 350°F. Bake bread for 30-40 minutes until a deep golden brown or when an instant-read thermometer inserted in the bottom of the loaf reads 200°F. Remove from oven and cool completely on a cooling rack before slicing or serving. I’ve always been one for tradition (cue the “Fiddler on the Roof” soundtrack!). Ever since I was little, even the slightest tweak or change to a holiday/event/meal puts me in a fit of rage. OK, that’s an exaggeration. But the point is, I really like tradition and habit. Especially when it comes to food. How does this tie into Hawaiian Sweet Bread, you ask? Well, I’ll tell you. Every holiday since the dawn of time since I can remember, my family sets out homemade spinach dip served in a store-bought Hawaiian sweet bread bowl as an appetizer. It’s the most retro-ly awesome and delicious thing you could possibly imagine eating, and me and my siblings always demolish it alongside our equally traditional servings of deviled eggs and cheese and crackers. So when I decided to buck the trend and make a homemade version of Hawaiian sweet bread this past Thanksgiving, a gasp heard ‘round the world rang out among my family members. But then, it was silent, while they all devoured the bread in less than half an hour. I’m telling you, this bread is that good. So good, in fact, that I plan to create a new tradition of making this sweet bread all year round – not just on holidays (wait, did you hear that gasp?). What makes this bread extra awesome is that it’s made with mashed potatoes, which means it rises extremely well, and most of that rising actually occurs in the oven. 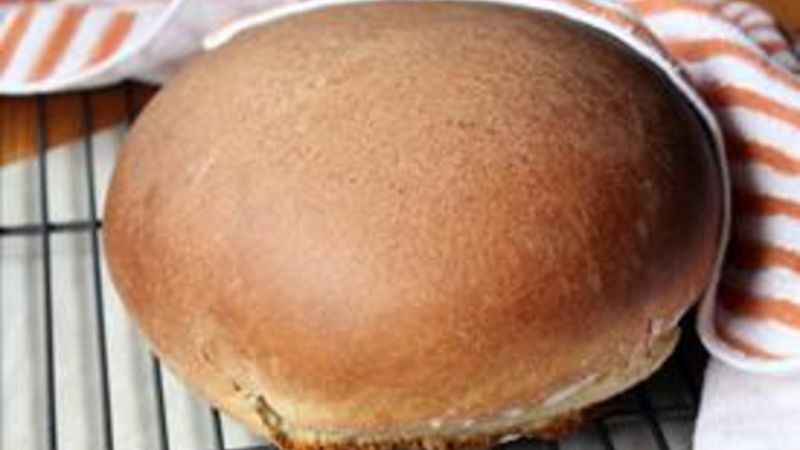 Case in point: When I put the bread in the oven to bake, it looked like a typical free-form loaf, but when I took it out, it had transformed into that signature glossy, puffed dome. And the taste? Well, let’s just put it this way – you don’t even need the spinach dip on the side to enjoy it. Though if you’re all for tradition, it’s still highly recommended.